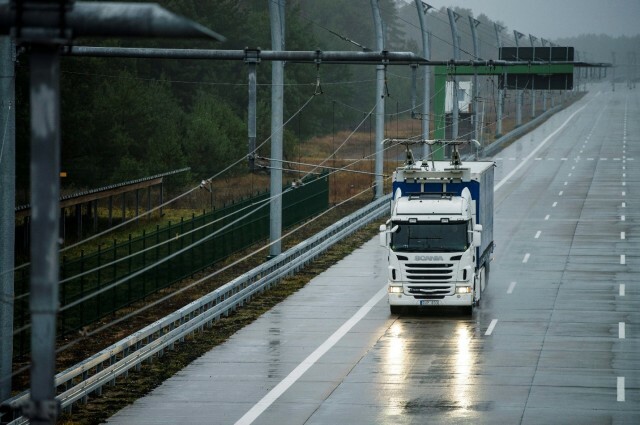 The world’s first electric road is now active for a distance of 2 km on Sweden’s E16 motorway. The technology utilizes conductive technology, which enables trucks to drive as electric vehicles through this strip. Electrical power is transmitted to the truck using a pantograph power collector. The device is installed on the frame of the truck, behind its cab. Overhead power lines on the right-hand lane of the road are connected to the pantographs, and connection as well as disconnection can be achieved while in motion. While not in the electric lane, the truck operates using its combustion engine or battery-powered electric motor. This is also the case when drivers overtake other vehicles on the electrically powered area of the road. In addition to making bounds towards Sweden’s environmental goals (as well as the economic benefit in terms of savings), the electric road is beneficial in another way. It provides an edge over Sweden’s competition in the sustainable transport field, an area that is moving along very quickly. The electric road required several years of development and was the result of a collaborative effort. Both the private sector and the Swedish government were involved in this project. Scania, which developed the road, is part of Volkswagen Truck and Bus GmbH and is a manufacturer of heavy transport trucks and buses. Scania is based in Sweden, but its production takes place throughout Europe and South America. For more on sustainable transportation, this solid oxide fuel cell is cleaner than fossil fuels with more stamina than electric vehicles.